So, Does It Matter Whether We Say That Bodies 'Lie in State' or 'Lie in Repose'? That's the question that hit me after I wrote this post. In the end, I suppose, it doesn't much matter. The deceased is just as dead, whatever term we use. The death of a president may not be without its use in reminding us that we too must die. Death is the same with the high as with the low. But we are not so much roused by the fall of the many and distinguished as we are by that of well known name. By the latter, we are forced to muse and ponder. Lincoln is right, I think. To this day, the casket of a President, whether its remains are referred to as lying in state or in repose, can remind us of our own mortality and of our need for the God we meet in Jesus Christ, the One Who imbues this life with meaning and promises the free gift of infinite tomorrows with Him, that's a good thing. Death without Christ is futile. Death for those who believe in Christ erases futility in this life and in the one to come. Lying in State? Or Lying in Repose? That term, lying in state, didn't look right to me. I was fairly certain that only the body of a President or that of a deceased person deginated for the honor by the sitting President could truly be said to be said to be lying in state. Because of all of this, I thought it better to speak of Mr. Gillmor's body lying in repose. In the United States, state funerals are granted by law to Presidents-elect, sitting and former, and may be granted to other individuals as designated by the sitting president. The author of this piece could be misinformed, of course. Wikipedia isn't authoritative, after all. Visitors filed past the body of U.S. Chief Justice William Rehnquist in Washington this week. 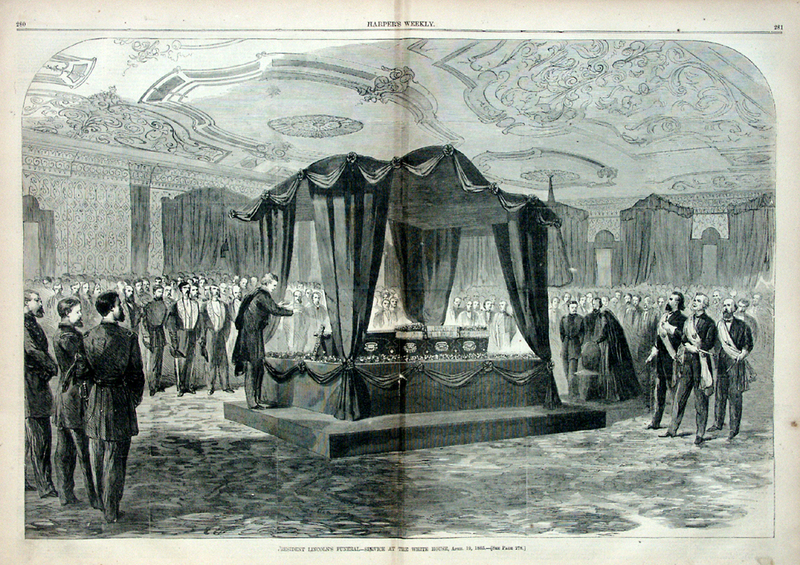 On Tuesday, both the president and the first lady viewed the casket, which sat atop the Lincoln catafalque in the Great Hall of the Supreme Court. Though some news organizations described Rehnquist as "lying in state," most called it "lying in repose." Is there a difference? Only in Washington. Funeral directors throughout the country use the phrases interchangeably: A body that's put out for public viewing could be described as lying "in state" or "in repose." When Pope John Paul II passed away in April, the presentation of his body at St. Peter's Basilica was described both ways in the news media. But when you're talking about official U.S. government funerals, "lying in state" has a special meaning: You're only lying in state in the formal sense when your body is in the Rotunda of the Capitol Building in Washington. But to say that a body is only lying in state if it's in the US Capitol shoots my definition to pieces. The Capitol, after all, is the seat of the legislative branch, not the executive. But even with this definition, one couldn't speak of Representative Gilmor's body reposed at the State House in Columbus as lying in state. The distinction between "repose" and "state" got its first widespread attention during the state funeral of Ronald Reagan last year. 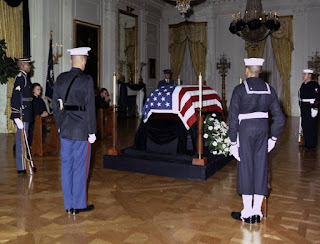 Reagan's body, like those of many presidents before him, was put out for viewing in multiple places. First, his remains spent two days on display at the Reagan Library in California. Then they were sent across the country to the Capitol Building. (Only 10 presidents have lain in state; many others have lain in repose at the White House.) Those involved with the ceremony made sure the media had the terms right: Reagan was "in repose" on the West Coast and "in state" in Washington. This came as news to me. Speaking personally, I didn't remember anything having been made of the "in state" and "in repose" distinction during the Reagan funeral. My first memories of being educated on the supposed differences between the two terms goes back to 1963 and to arrangements surrounding the death of President Kennedy. But, even accepting the Slate piece's assertion that funeral directors are behind what official Washington regards as a misuse of the term, lying in state, should their usage now be deemed authoritative? My guess is that the widespread adoption of the term "lying in state," applied to pop stars like James Brown and Supreme Court justices like Rehnquist, goes back to my generation's experience of John F. Kennedy's death. For days, a nation with only three television networks simulcasting the memorials, the funeral, and the burial, was riveted by the tragedy. We saw the President's casket lying in state in the Capitol. The term came to refer to the body of any person lying in a casket in a public place where people could pay their respects. Language and terminology get misused all the time. And, while common usage often gets its way and changes the ways words and phrases are defined by dictionary editors, it doesn't mean that those who insist that some terms are intended to mean specific things are always wrong. 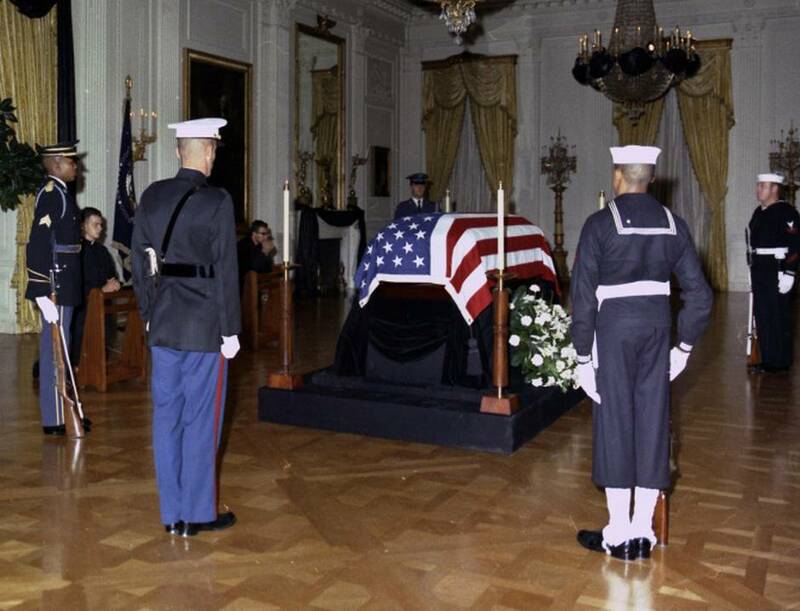 It seems to me that to speak of our late Presidents' bodies lying in state, whether in the Capitol, the White House, or elsewhere, is a way of acknowledging our unique Constitutional system and a great opportunity to provide civics lessons to Americans. Lord, help me to see your hand at work creating each new life. Whenever I see a baby lead me to acknowledge your power. On August 25, I wrote about what I think was a sad rush to judgment on the part of some in our community. The object of condemnation was--and remains--a mother, assistant principal of one of the middle schools in our district, who, from all indications, accidentally left her child in the family SUV on a roasting day, August 23. The child died of hyperthermia. "She knows that her actions are what caused her child to die, or her lack of attentiveness...She'll live with that. And I can't imagine what I could do as a prosecutor to make it any worse for her." White also pointed to Ohio case law which says that accidents in instances of hyperthermia are not criminal acts. It's apparently Nesselroad-Slaby's intention to return to work from her paid leave of absence. But many in the community are saying that she should be fired. Many are also condemning White for his decision not to press any charges against her. Some are calling her a murderer. It's tough for me to imagine that I would ever have become so consumed with my routine as to forget the presence of one of my children in the car. I'll grant that. And yet, many have been the times when, driving to say, the store, I accidentally headed to the church building instead. It's possible, I think, to get so caught up in our daily duties that we forget a sleeping child. Most days of the year, something like that could happen and the consequences wouldn't be so tragic. Nesselroad-Slaby was evidently thrown off her normal routine on the morning of her daughter's death and concerned about a major presentation she was to give to the Glen Este Middle School faculty that day, forgot about her sleeping daughter. As I mentioned in that previous post, I've never met Nesselroad-Slaby, but numerous mutual acquaintances have told me what a quality, caring person and what a loving mother she is. She appears to be devastated by this tragedy. Some things are simply accidents. This seems to be one of them. I do know White. I'm president of the Corporate Board of the Boys and Girls Clubs of Clermont County on which he also serves. While I don't know him well and we may see each other four times a year, at most, he has been a dedicated fund raiser for the organization, precisely because he cares about children and knows that the Boys and Girls Clubs do great work. I'm certain that if Don White thought that there was anything nefarious in Brenda Nesselroad-Slaby's actions, he would prosecute her to the full extent of the law. Apparently, hyperthermia deaths are increasingly common among America's two-income households. Blogger Icepick, who lives in central Florida, notes the death of one child, the circumstances of which bear resemblance to our local case. In the comments on Icepick's site, Pastor Jeff of Conblogeration mentions that a similar death just happened in the Saint Louis area. Both point to a recent study that demonstrates a dramatic increase in deaths of infants since were made mandatory. The presence of the airbags in the front mean that child safety seats are in the backs of vehicles, where sleeping children can more readily be forgotten by distracted parents. I'm praying that God will comfort the Slaby family. Rummaging through my old vinyl LPs tonight, I found this photograph, included as a stand-alone pic in the original 1971 release of John Lennon's Imagine album. In spite of the supposedly irenic intentions of the title track, Lennon's posing with a pig is a less than kind slam at his former Beatle bandmate and co-composer Paul McCartney. Such are the sorts of things that happen in the wake of messy divorces and the break-up of the Beatles was among the biggest messy divorces of all time. 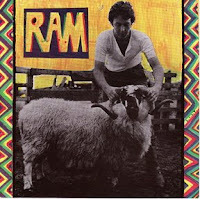 Lennon's pic was a send-up of the cover of McCartney's 1971 LP, Ram. By 1971, Lennon was in the second year of his hipper-than-thou campaign, attempting to prove himself the avant garde rocker to Macca's bland Muzak Man. He did this most notably in the famed interview he gave to Rolling Stone's Jann Wenner. Oddly, he seemed to convince the Rock and Roll intelligentsia of the accuracy of his spin in spite of the body of Beatles work, which showed both McCartney and Lennon to be equal part rockers and balladeers. Because the Rolling Stone interview was turned into a book which probably sold even more copies after Lennon's tragic murder, his assessment of McCartney became a sort of textus receptus for music critics and other Rock elites. McCartney-bashing went hand-in-hand with Lennon-eulogizing in spite of the fact that the two "divorcees" had reconciled long before that fateful day in December, 1980. Feuds can produce headlines. They can cause others to line up to take sides. They even bring in revenue. But, my reaction to the Beatles feuding and clash of egos is similar to that of U2's Bono. I once heard him say that a motivator for his bandmates and him to stay together is that they wonder what might have happened had the Fab Four stuck it out. We'll never know, of course. But, Lennon's death, so tragic and unexpected, which came before he and another Beatle, George Harrison, could reconcile, also serves as a pointed warning to us all to drop our grudges at the earliest opportunities. Tomorrow never knows, as Lennon famously sang; but more significantly, we can't know even if we have a tomorrow in this life. Better to reconcile than to live or die with regrets. "If you forgive others their trespasses, your heavenly Father will also forgive you; but if you do not forgive others, neither will your Father forgive your trespasses" (Matthew 6:14-16). Of course, because we're all sinners, having the forgiveness God offers to those who turn from sin (repent) and entrust their lives to Christ (believe) is critically important. Unforgiven, we stand before God in our sins, unworthy for fellowship with God and for eternity with Him. Forgiven, covered with Christ, we're reconciled to God...forever. Is there any grudge we hold so worth holding onto that we're willing to walk away from God and all His blessings? Well, have you bought your Appalachian State sweatshirt yet? In Michigan's defense, Appalachian State was no standard issue first game cupcake. * But if the rumors are true that Lloyd Carr always has intended for this to be his last season in Ann Arbor, I think it unlikely that the U of M A[thletic] D[irector] will now beg him to reconsider. As I told Pastor Jeff at Conblogeration, Carr has become Michigan's equivalent of Earl Bruce and John Cooper, two winning Buckeye coaches who didn't win big games or beat Michigan. The only difference is that now Carr [1 and 5 against Ohio State since Jim Tressel took over as coach of the Buckeyes] has failed to win what was considered a "little" game. *As I wrote "Michigan's defense," in this sentence, the cruel side of me thought, based on the team's performance on Saturday, those two words comprise an oxymoron. This morning's top story in The Cincinnati Enquirer recounted how a driver, trying to avoid a Labor Day weekend drunk-driving checkpoint, allegedly made a U-turn, led police on a chase through several area communities, hit and killed a motorcyclist, and then fled the scene. If allegations against Kenneth Haugabook are true--and it appears they are true, this is a very serious matter, especially his decision to leave his unsuspecting victim to die. "He [Haugabook] caused the life of a person to be taken because he was avoiding the police," ...Jones said. "It's a tragedy and it's terrible." "He never stopped or gave aid," the sheriff said. "There are some people in our society who are very sick and care more about themselves. "This is a very mean-spirited individual," Jones said. What so interests me about Jones' words is that, on the surface, they don't seem to reflect his legal assessment of Haugabrook's actions. They appear to reflect a purely moral judgment. Is that right? Should a public official, especially one who's charged with the impartial enforcement of laws in a pluralistic society, talk about morality? But one would be hard-pressed to name any religion or worthy philosophy that would call the actions Haugabrook is alleged to have committed anything but wrong. They also happen to be illegal. All of which raises an interesting point: Law, every law, even laws dealing with seemingly mundane issues, are meant to enforce the common moral values of a society or community. We citizens "hire" police, sheriffs, prosecuting attorneys, and presidents, in part, to enforce the basic moral values to which we all--Hindus, Buddhists, Jews, Muslims, Christians, and others--share. We have speed laws. for example, because of moral values, because as a society, we deem it wrong to waste a non-renewable resource like the gas in our tanks and because speeding vehicles endanger other motorists, pedestrians, and motorcyclists. Conservation of resources and of human life are moral values. None of this is to say that there aren't lousy laws on the books or that some politicians don't hide behind moral niceties to make sweetheart deals that fatten their wallets or that they don't engage in pork barrel spending that enhances their chances for re-election. The law is abused by legislators, courts, and executive decision makers. But any pol who has a hand in such shenanigans will always try to cover his or her true motives by hiding behind a posited value--some certain moral good--as a reason for their action. In a pluralistic society, laws are designed to enforce our common moral values. Societal values change over time, often because of enlightenment or mature consideration. Prohibition has been first written into and then out of our Constitution, for example. Both actions reflected the country's values at the moments of their passage. Laws put on the books always demonstrate what societies believe to be right and wrong at any given time. When values change, so do laws. But Sheriff Jones' assessment of Haugabrook's alleged actions also reflects the collective moral judgment of our pluralistic society today: It's selfish to hurt someone and leave them to die. May we never change our mind on that as a society! A daredevil wanted to use a motorcycle to jump over a portion of the Grand Canyon. The place where he wanted to do this was so wide and the canyon below so deep that nobody--not even Evel Knievel--had ever tried jumping it before. When he went to his engineer and mechanic, they both said it was a looney idea. When he approached his usual financial backers and insurance company, they said that if he tried something so stupid, he’d be on his own. His wife and kids were totally against it. The TV networks, in spite of their apparent love of death and mayhem, wouldn’t pay to cover what they said was his certain death. But the daredevil was intent on following through. He scraped together most of the money he’d earned from previous stunts and personally outfitted a bike for the jump. The day for the jump came. The daredevil revved his engine, tore down the runway, hit the ramp at more than 200-mph, and began soaring through the void above the canyon. Everything went well until he got about halfway across. That’s when gravity took over. The daredevil plunged to his death. Last week, in the first installment of this series on Funny Church Words, we talked about grace. Grace is God’s undeserved, unearned gifts of forgiveness and new life which become ours when we turn from sin--repent--and receive Jesus Christ as our Lord and our Savior. But there’s something that gets in the way of our receiving God’s grace. We can be a lot like that daredevil. God may offer us grace repeatedly. But we can refuse His offers. Those who refuse the grace offered to all people through Jesus Christ are daredevils who inevitably plunge to their eternal deaths. But why do people refuse God’s grace offered in Christ? God’s forgiveness, presence, and guidance in this life and the promise of everlasting life with God are such good things, why would anybody ever turn Christ down? The Bible teaches that our sin causes us to refuse God. The Bible has two main ways of picturing sin. To understand the first way, imagine yourself in a carnival hall of mirrors. The distorted shapes and angles of the mirrors result in distorted reflections of your image. That’s largely how the Old Testament speaks of sin. It’s a distortion of our true selves. As you know, Genesis teaches that human beings were created in God’s image. But sin distorts us and how we look at the world. To understand a second major way in which the Bible portrays sin, picture yourself standing before a target, bow and arrow in hand. Then, see yourself pulling the arrow back, taking aim, and firing. And missing. And firing again. And missing again. This is how the New Testament usually pictures sin. Deep down, each of us has a common target. We want to live our lives as fully human beings, in sync with God and His will. But the target is always elusive, always beyond our ability to hit. You and I are likely to refuse God’s grace because we won't allow Jesus Christ to clear our heads and set us free to make wise decisions about this life and the one to come. When your will is distorted by sin, grace seems too good to be true. But God has a strategy for overcoming the reign of sin over our lives. He always has! We see it in today’s Bible lesson. It recounts an incident from the life of Abram, later to be renamed Abraham by God. He lived some two-thousand years before the birth of Jesus. We know Abraham as the father of God’s chosen people, the Jews. But when we meet him in today's lesson, Abram is nobody's father! Then, the Bible tells us that Abraham did something very strange. He believed in God and in God’s promises. The Bible tells us that God looked at Abraham’s faith and counted Abraham’s trust in God as righteousness. The antidote to Abraham’s sin was his faith, his trust, in God. Today, that same antidote is available to all who believe in God-in-the-flesh, Jesus Christ. God calls us to believe that our sin cannot destroy us because we trust that when Jesus died and rose two-thousand years ago, He crushed sin’s power over us for all eternity. Faith in God is easier for us than it was for Abraham. To uphold his faith, all Abraham had were some stars in the sky and a promise. You and I can point to Jesus on a cross and to His empty tomb. Those are accomplished facts which incited otherwise practical, down-to-earth people like Peter and Thomas to stake their lives on their faith in Christ. Of course, we’ve never seen Jesus face to face. That can make it hard even for us to have faith sometimes. Soon, I heard God’s Word read. It sounded like a love letter from God. I listened to and drew hope from the message by the pastor. I received Christ’s body and blood in the bread and wine of the Sacrament of Holy Communion. Something happened to me: God filled me again with faith. God reminded me again that He’s here and that we can trust in Him. God used His Word, His Church, and the Sacraments to remind me of His presence, His promises, and His faithfulness! Faith isn’t something that we convince ourselves about. Faith isn’t an intellectual thing, although it should engage our minds. It isn’t an emotional thing, although our hearts will be touched by it. Faith is rooted in the empirical realities of Christ’s death and resurrection and in our willingness to believe. In the end, faith is completely a construction of God, a tower of hope and strength that God builds when we allow Him to do it. If we want faith, God will give us faith. That’s really the point of some the letters of Mother Teresa that we’ve been hearing so much about this week. She saw and dealt with the worst in life and struggled to believe. But she laid it all at God’s feet and allowed Him to help her keep trustingly serving God and her neighbor. Sometimes a Christian’s faith is, as Jesus said, only as large as a mustard seed. But that’s all the faith we need. Little faith in a big God can still move the greatest mountain. Look at what Mother Teresa did for God and for the dying on the streets of India when she put her small faith into action! In our last lesson today, Jesus says, “When the [Holy] Spirit...comes, he will guide you into all the truth; for he will not speak on his own, but will speak whatever he hears, and he will declare to you the things that are to come. He will glorify me, because he will take what is mine and declare it to you.” There's an old saying that tells us, "If you feel distant from God, guess who moved?" When we allow ourselves to get close enough to Jesus, the Holy Spirit will create and deepen faith within us. Faith in Christ sets us free. Give God the go-ahead and He will fill you with just the faith you need for today and for all eternity! Next week, our funny church word will be discipleship. *It might just as well have caused him to think himself completely unworthy because whether we think of ourselves as gods or as nobodies, the culprit is the distorion of our natures caused by sin.